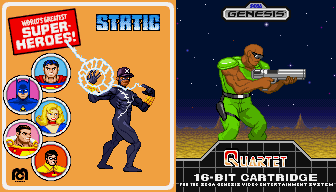 I just stopped by to drop off a few new custom sprites: Static in his original Milestone/DC comic book outfit (and Static #1 pose) and Edgar, one of the four heroes from Sega’s 1986 sci-fi platformer, Quartet. The sprites have been added to the proper custom sprite galleries and are in the GFX Generators with fighting game sprites. Static has his original logo there. The next full-sized site update (early March) will include something interesting for the GFX Generators. That’s all I’m saying for now. Currently busy with many things, including cooking up a few things for future themed updates for this site (and I’ll dedicate a whole post to that soon). I just wanted to make another update so you know that the site is still kicking. Game Index – Adjustments were made to many entries and the engine itself, including one to the screenshot area. The main index page now lets you check out games according to genre. There are almost 100 games in there right now, so that took a while. Most of the games have at least one screenshot now. 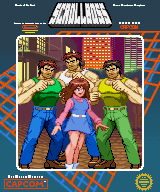 Sprites – More sprites were added to the following galleries: Superman (arcade), Vigilante (arcade). 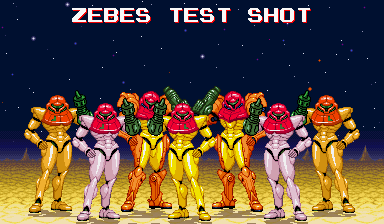 GFX Generators – a recreation of the Metroid NES title screen has been added to those variable background screenstyles in the Vs. Maker and GroupShot generators. Capcom: Avengers/Avenger Ryu & Ko (full ending pose). All new custom sprites were added to their Custom Sprite galleries as well.